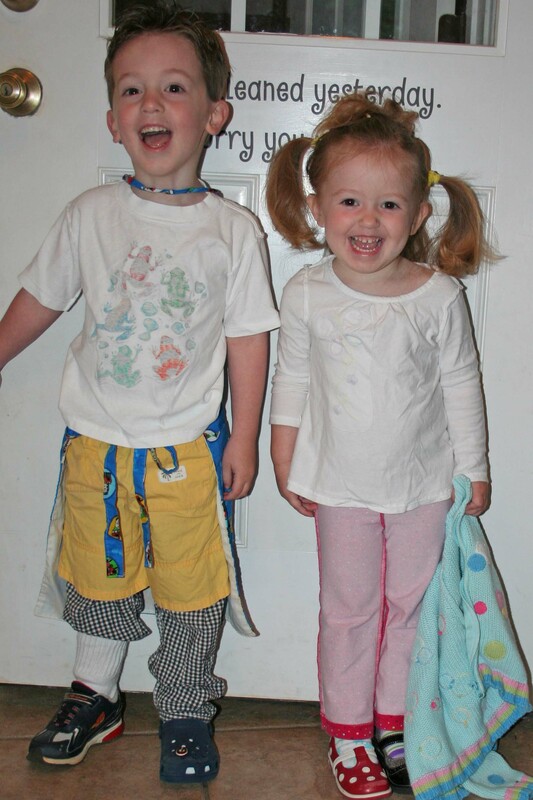 My kids had pre-school on April Fool’s day and they called it “Wacky Day”. They were supposed to have crazy hair & clothes. So we put shirts and jackets on backwards and Lydia’s pants on inside out. Carter had shorts on over his pants. I started to put underwear over pants but decided that was a bit far for preschoolers. (It would have been funny though…) Carter wore his hair “spike-y” and Lydia had a 5 ponytails in her hair. They thought it was hilarious. I thought it was cute. See? Fastforward to this morning. Looking at the pantry and fridge, there’s very little of substance here. I really need to go to the grocery store, but it’s a freakin’ monsoon outside. I have no desire to get soaking wet dragging 3 munchkins to the store. So…we’ll be eating fruit snacks and chips for lunch…because that’s what I have available. So I told the kids that we’re having “wacky day 2” and we’re going to be having a “wacky” lunch. Does that make me a horrible mommy? I feel a little bad about it. But not bad enough to put on pants.